MODULAR HOME BUILDER: West Coast Reporter Says that Pre-Fab is Making a Comeback! West Coast Reporter Says that Pre-Fab is Making a Comeback! You heard me correctly. Pre-fab housing was in a decline and lost in the wilderness but a West Coast reporter for LAWeekly says that - get ready for this!...Walt Disney's great nephew, Dewey (his name is really Tim Disney) along with Blu Homes are single-handedly bringing the pre-fab and modular industry back from the dead. Update 9/22/12: I just learned that Abby Disney, a grand niece of Walt Disney was one of the original investors in Blu Homes and Tim is her brother. Can this really be counted as a retail home? Could prefab be making a comeback? Prefab, or prefabricated buildings, are typically manufactured in component parts, typically in a factory, then shipped and installed on-site. Pre-housing bust several developers specializing in prefab lauched in SoCal, including Marmol and LivingHomes, delivering mass-produced modern homes. These homes, while having a high design quotient, were often not much cheaper than a custom-designed home on a per square footage basis. Enter Blu Homes: the latest entrant into the prefab space focused on sustainable solutions aiming to provide affordable housing. One of the earliest prefab innovators marrying architecture and manufacturing was Michelle Kaufman, who launched her eponymous architecture firm in 2002 in the Bay Area specializing in green homes that used modular, prefab technology. While her firm closed in 2009 due to the tanking housing economy (she later opened a new design firm), she sold several of her designs to Blu Homes. 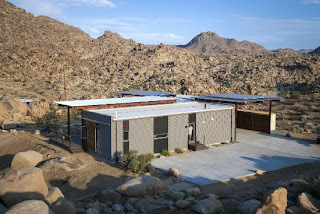 This past weekend, the first Blu Home in SoCal, set against the alien-esque desert backdrop of Joshua Tree, was open to the public for a tour. This must be the first of that $60M in marketing money that Blu Homes got at work. It would seem that they are reviving an industry that doesn't need reviving. What needs reviving are the people that are actually buying all those Lego-style, Architect designed, flat roofed single wide homes. Paying $300+ for a single wide that unfolds after delivery is something that has to mystify anyone with a brain. I'd like to see your analysis of other "boxy prefabs" that are not on the west coast. After all, it was not even till recently that Blu was on the west coast. These are both boxy prefab modular brands that are not on the west coast.